Richmond has signed the seventh player to its inaugural AFLW list in Monique Conti. The stakes are high for Melbourne in Wednesday night's Anzac Day eve blockbuster against Richmond at the MCG. The Yellow and Black Photo Flashback series continues today with this photo of Bill Cosgrove. The VFLW Tigers will face off against the Australian Defence Force Women's All Stars this afternoon in the Women’s Anzac Challenge Cup. The ins and outs for AFL round six, starting with Richmond v Melbourne at the MCG. Melbourne has swung five changes for its must-win clash with Richmond at the MCG. Matthew Richardson previews the Round 6 Anzac Eve clash against the Dees on Wednesday night at the MCG. Richmond has been allocated the prized No.1 pick in the 2019 NAB AFL Women's Draft as a priority selection. Trent Cotchin's return has been delayed, with coach Damien Hardwick announcing he will not be playing in round seven against the Western Bulldogs. Richmond skipper Trent Cotchin remains several weeks away from an AFL return after having a setback in his recovery from a hamstring injury. Richmond forward star Jack Riewoldt will return to the side to face Melbourne on Wednesday night in the Anzac Eve clash. 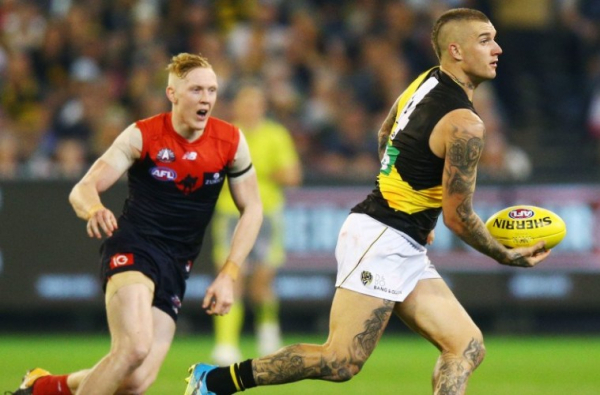 Richmond star Dustin Martin and Puma have mutually agreed to part ways just 14 months after signing a four-year deal.